There is nothing worse than being awaken from a sound sleep at 3 am by your child who has just had an accident in bed. It happens to a lot of us and it happens to me more than I care to admit. We've taken steps to prevent this from happening by limiting the amount of liquid our daughter drinks and making sure she doesn't drink anything an hour before her bed time. It's helped but it's not 100%, the sad thing is we've done this enough that even in a zombie like comatose state my husband and I can change her bed and get her washed in a matter of minutes, it's something I'd like to never have to do again. 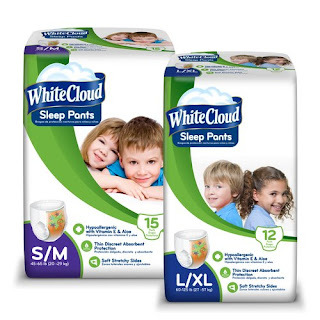 One of the other steps we've taken is by getting White Cloud Sleep pants, we don't think it's laziness with our daughter, she's a sound sleeper a very sound sleeper and we believe that's what her issue is. But still we need to make sure her bed doesn't get ruined because we spent a lot of money on it and I don't want to replace it. Also it's something she hates, she hates not being able to “feel” when she needs to go but because she could sleep through a tornado it's a problem we've had to learn to deal with and to be able to remedy. The White Cloud sleep pants have helped, it makes her aware of her issue and she's actually gotten up in the past few weeks in the middle of the night to go to the bathroom. What we really like about the sleep pants are that they are thin and look like underwear and not a diaper, the object is to fix the issue and not make your child feel worse about it. The White Cloud sleep pants are thin but they are super absorbent and hold a ridiculous amount of liquid without any leaks, we totally trust these sleep pants to protect her bed. We plan on using the sleep pants until she has total control of her situation, she'll be wearing the sleep pants to make sure nothing too bad happens other than having to use a new pair of sleep pants. Better to have to change a pair of sleep pants and not have to change an entire bed and give her a bath at 3 or 4 in the morning! Did you know that over 5 million kids a year experience bed wetting and it is one of the most common experiences during childhood development? Those look great. I will have to tell my friend who has a child that could use these!!! I haven't got to this stage in life yet but I'm bookmarking it so I'll remember these for later down the road. Thanks for sharing! Bedwetting is so common. This sounds like a helpful way to deal with it. Those look great! We'll be switching to those with my son shortly. THose look great. I love all the new products they've came out with since my children were potty trained. I need to try these. My toddler has been having a rough time with potty training lately. It breaks my heart. We'll have to try these. My boys both wore sleep pants when they were younger. These sound like a great alternative to the other really expensive brands. Thanks for sharing! 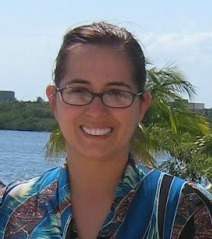 I relied on this kind of thing for peace of mind, so I'm glad White Cloud jumped into the biz!